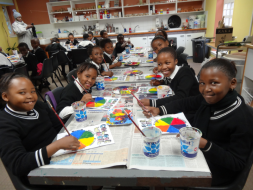 The Art Museum runs a visual art programme for school groups, Grade 1-9, which are linked to the exhibitions on show and are adapted for each grade. The workshops are run on a Monday, Wednesday, Thursday and Friday from 9h00 – 12h00 during the school term and entrance is free. Booking is essential. The school workshop programme works on a first come first serve basis and Educators must phone to make a provisional booking. The booking is only confirmed once written correspondence is received from the Art Museum.